Well I'm not happy with this. After all this work I'm just gonna wipe it out and install Debian. This KDE4 seriously annoys me. Maybe some people like it but I find it counterintuitive, uncooperative, full of bugs, and just plain aggravating. I can't seem to understand it. Everything, and I mean literally everything, is just plain bassackwards. I spent two hours trying to figure out how to close the add widgets to panel dialog. The close button is hidden. If I hadn't of accidentally moused over it in the corner I would never have found it. It's just a plain stupid design throughout with no logical reason for its behavior. How's that for a glowing recommendation? I think I'm done with Mandriva for awhile. Time for me to find another distro. Debian with Gnome 2.28 looks really attractive. Oh, I forgot to mention, I've already broke it. I installed something that replaced the kernel then did urpme remove auto orphans or something like that and now it won't boot. I have to select another kernel. I don't have the patience to edit grub at this point. Edited by V.T. Eric Layton, 23 January 2012 - 02:30 PM. Oh, I forgot to mention, I've already broke it. I installed something that replaced the kernel then did urpme remove auto orphans or something like that and now it won't boot. I have to select another kernel. I don't have the patience edit grub at this point. 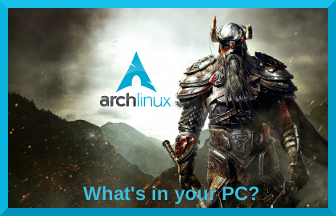 I was going to suggest Arch with E17 but as you have shown a preference for a Debian distro then this may be a perfect fit for you. oh I know Dreamlinux. Didn't realize it was still active. Wheezy with xfce 4.8 sounds interesting, hmmmm? I think I'm turning into an old stick in the mud. Me likes old and stable without frills. AHEM! Well... it's best that I don't comment here. Hmm... Slackware, Arch, etc. w/ Xfce, maybe? Must say, that Dream Linux looks pretty sharp. Maybe if I had a quad core CPU with 8+ gigs of memory I would give it a test drive. But like KDE 4+, it's just to much for my much older hard ware. It's funny, I started my linux adventure in September 2010 with Mandriva 2010.0 KDE 4.3 and at first I was impressed with the eye candy but it did not take to long to get bored. I guess as you stated, as you get older, you start appreciating stable and no frills. I agree that Arch or Slackware with XFCE would really suit your needs and you can make is as frillful or fill(less) as you want. Have never tried Debian so I can't speak for that but have heard great things. Good Luck Steve, I am sure you will make a decision that you will be happy with and for all its worth, you have A LOT of knowledge here with Slackware and Arch to help you get an OS you will no doubt be very happy with. Debian is like a 85 year old man compared to Slack and Arch at 65 and 45, respectively. Ubuntu, Mint, PCLOS, and those guys are younguns in their mid-20s. They're exciting and full of high-risk unstable software, but they're pretty and eye-catching. Debian is a wise, rock-solid, VERY experienced old man. However, being that old man means that he's not too risky or innovative. His apps are stable but stale. Still, if you want something you can depend on every day, Debian is the one. Oh, and Gentoo is just an alien species of some kind. I agree, great analogy. Curiousity is getting the best of me. Might need to take the "Live DVD" of Debian for a test drive. It's only recently that I haven't had a Debian install on any of my systems. I used to use Debian as my backup OS... then Arch won that position. I had issues installing Debian 6.0 when it came out. I never bothered to try again. I kinda' miss having Debian around. EDIT: Downloading Debian 6.0.3 now, actually. Maybe I'll give it another go. I guess it's what floats your boat, but I would have to agree about either Arch or Slack. Personally I like either Fluxbox or lately Openbox over XFCE but I have been known to go with JWM and to really customize it! (which can be fun in itself!) Have fun whatever route you take! I also would recommend Debian. Sure it's not as bleeding edge as some distros (well, the stable version isn't), but that also means it won't cut you fingers. Also it (usually) works straight outta the box with very little config, unlike Slack or Arch which take more to set up. I KNEW IT! I mentioned Gentoo and here comes Greg (trigggl). It's like an alarm of some sort. lol, thanks guys. I've already got it. Debian 6.0.3 Gnome 2.30. Took me a whole hour and a half from start to finish. wham, bam, thank you Debian. NVidia driver installed, xorg configured for TwinView, panels customized, etc. No problems. Everything is tweaked except the repos. I only know how to add repos to Mandriva. What repos do I need to get the restricted packages? testing? backports? PLF? Anyone know the correct URLs? Actually I know how to add them I just need to know what to add? I did seriously consider Slack but decided I wanted to get some experience on a deb distro. Have been on an rpm distro all my Linux life. I think I'll put Slack on my tester machine and keep that in the wings. You know, after fighting all day Saturday with Mandriva KDE4 and then jumping into the calm, peaceful environment where everything works of Debian Gnome 2.3 I don't feel angry at KDE. I feel sad for them. I believe there is something seriously wrong within that project or maybe it's just me and my machine. Edited by cybormoron, 23 January 2012 - 10:22 PM. Everything you'll need to know about sources.list right HERE, Steve. I put us. in there because you are in the US. For other countries, substitute you own country code after checking if there is a repo there, or use the closest one. Mine is au for Australia. It is not recommended to use testing repos in stable, use backports instead. PLF is a Mandriva thing, most packages from there will exist in contrib or non-free. There are also a few useful things in debian-multimedia repo, but I haven't used it for a while. If there is anything you need but can't find in these repos, just post and I'll see what I can find. BTW, I've been using KDE4 for nearly 2 years now and think it's great. Totally different from Gnome of course, but then I don't like Gnome. Just use what you like. Yup. Some folks like KDE 4.x. Nothing wrong with that. Use what you like best. That's what it's all about. In the last couple of days I have run the live CD for both Mint 12 (Gnome) and Debian 6.0.3 (Gnome) and to be honest with you, I don't see any difference. Sure they have both their own default back grounds. One might use Banshee where the other choose Amorok but in the grand scheme of things they seem almost identical. Now I realize there will be differences in how they handle packages and what not but the basic look is the same. I guess it's more the Windows Environment (Gnome) that gives it that same look across distros. Safe to say if I ran both of them as KDE 4.3 they would look equally identical. I have always recommended Mint to people that have had an interest in checking out Linux. I have even partitioned a few peoples computers and got them dual booting with Windows and Mint. But it looks like I could easily recommend Debian or many of these other big name OSs that use Gnome as their default WE. Don't be misled by the eye candy, Ian. Debian and Mint are quite a bit different under the hood (where it counts). In the case of those two, the main difference is which apps they come pre-loaded with on initial install and what versions of apps are available afterwards in the repos. Mint's repos contain apps that are, in some cases, years newer than the ones in the Debian stable repos. For instance, Deb's current version of Ice Weasel (Firefox) is 3.x. The actual current version of FF is 9.x, soon to be 10. That's just one example. If you're only looking at the desktop, nearly all distributions, from Ultimate Edition all the way up to Ark and Arch basically look identical if they're running the same desktop environment/windows manager. Gnome is Gnone is Gnome, in other words. The main difference between distros is usually the package manager and the repos. There are other diffs, of course, like how X is rendered or whether the distro is using hal, udev, etc. By the way, vanilla Debian is still running a 2.6.x kernel out-of-the-box. Its legendary stability is based on the fact that it really tests for a long time before releasing to stable, which makes for older version stale apps, usually. Nothing exciting to see here, folks. Move along now. Debian is a plow horse compared to Mint's thoroughbred racehorse. Hey! I'm on a roll with the analogies lately, huh? Oh, and Gentoo is a Lego-like contraption made by three foot tall green aliens from the Cygnus X1 system. One of these days, I have no doubt, I will be seeing a Gentoo logo in your signature, replacing all the rest. I really need to take a look at this Gentoo as you have mistified me with the many comments about it. You absolutely right about what is under the hood. The 3 machines that I have dual booted for clients have all wanted the same thing. An alternative to Windows where they can surf the web without being worried about getting Virus' or Malware. They want to be able to listen to music, they want easy access to a file manager, etc etc. All the things they are used to in Windows. So far 2 out of 3 say the spend more time on Mint then they do Windows. Most folks whom I have "converted" to Linux, I've introduced them to it using Ubuntu or Mint. 9 out of 10 or so admit that they don't boot Windows at all anymore. That's a pretty good conversion rate. I actually had one friend ask me to re-do his system and get rid of Windows entirely. He figured he was just wasting drive space on something he never used anymore. Me? 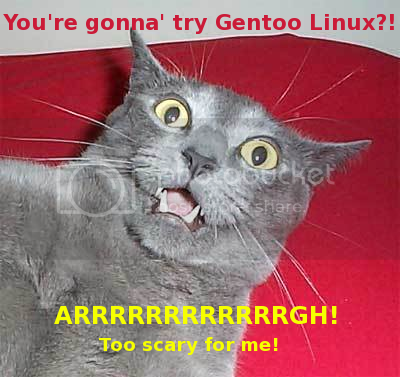 Gentoo? HA! We'll all be slinging the ol' slush balls in H3LL when that happens. thanks Eric and sunrat. looks like it was easy to add one line. I am having a little problem finding a few packages. also, can I uninstall gnash and use the proprietary flash? Edited by cybormoron, 24 January 2012 - 10:44 PM. You might also want to add contrib and non-free repos, Steve.